San Camp is the most authentic and classic safari camp in Southern Africa, evoking the atmosphere and elegance of a 1940's East African safari. San Camp is unique in that it is the only permanent (other than Jack Camp) camp to offer a chance to explore and understand the Kalahari. 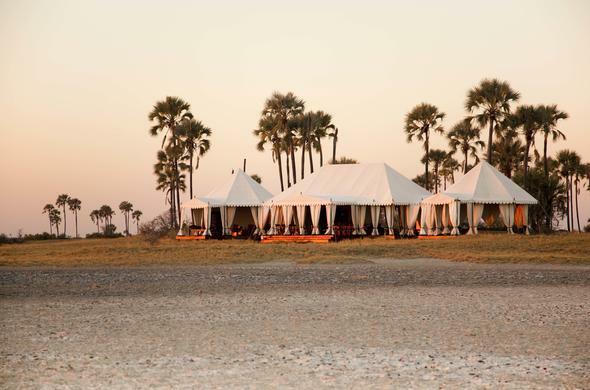 The concession adjoins the Makgadikgadi National Park with its endless vistas of rolling golden grasslands. Desert palms line the horizon, and behind the camp are huge salt pans of the Makgadikgadi National Park . This Botswana game lodge is the only way that guests are able to experience the Makgadikgadi and understand the Kalahari. You will also gain a unique and sensitive insight into the tradition and culture of the Bushmen people. The Makgadikgadi is an extinct superlake, covering an area the size of Switzerland, with not a single human inhabitant, and one of Southern Africa's most dominant geophysical characteristics! The Kalahari is the desert with the highest species diversity and is home to many unique desert-adapted species such as Brown Hyaena and Suricate, which you will not be able to see elsewhere in Botswana. San Camp activities offer an opportunity for guests to gain a holistic understanding of Botswana's wildlife, its geography, geology and its people. This is a very different product and experience to that of the other camps, which only offer game drives, walks or mokoro (dug out canoes) trails. It's therefore very important that guests spend 3 days, if at all possible. San Camp guides and management staff have passed a comprehensive First Aid Course conducted by Medical Rescue International. All guests are covered by San Camp's insurance to be evacuated in a fully equipped medical aircraft which will get them to the nearest and best medical attention in the region. San Camp is a unique permanent tented camp located on the edge of the Makgadikgadi Salt Pans in the Kalahari Desert of Botswana. The Kalahari Desert has the highest variety of species and is home to many unique desert-adapted species such as Brown Hyena and Zebras.